With the time change, Sharon and I were both up very early. We had breakfast in the condo and then got an early start. Driving through the area in Kona just north of the condo, we were very impressed. We need to explore the area around the condo! We drove north up the Kiholo Coast. I was amazed at the starkness of the scenery; it is lava fields for miles and miles. This is the dry side of the island. We frankly didn't plan the morning out very well. 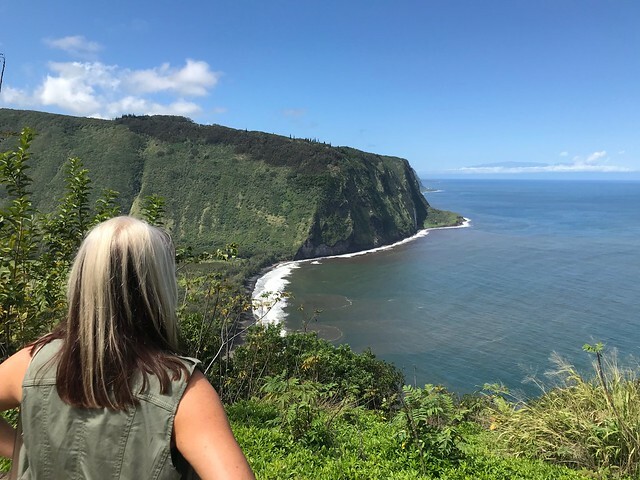 We made stops at a lookout over looking the coast, the Lava Lava Beach club and the Puukohola Heiau National Historic Site. The last is billed as one of the most historic sites in all of Hawaii. We did a walking tour of the site. From there, we headed up to Waimea. This village is at 2,600 feet. The terrain couldn't be more different than the Kiholo coast. We had an early lunch at Village Burger. We both had a Hawaii Big Island Beef Burger. It was excellent. After lunch, we stopped for a quick beer at Big Island Brewhaus. 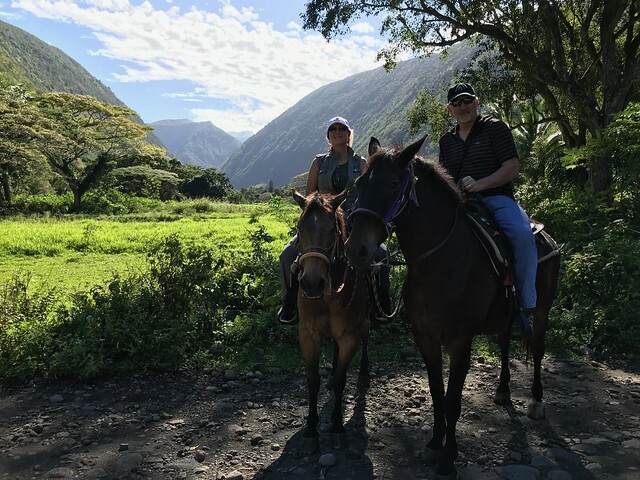 The plan for the afternoon was horseback riding in the Waipi'o Valley. We drove to the valley outlook and then back to the ranch. Signing in, we will be with a group of Japanese tourists. They loaded us into a four wheel drive van and took us down into the valley. The road into the valley is wild. It is a one lane 25% grade dropping 1,000 feet in less than a mile. We spent a couple of hours touring the valley on horseback. I ended up at the front with the lead guide for most of the ride. He spent the trip describing all of the foliage. There is a bewildering array of plants and trees with lots of non-native species. I enjoyed the ride more than I thought I would. I am perplexed by the accents of both the van driver and the person leading the horseback ride. Sharon said that it is a Hawaiian accent.